Santa arrived yesterday at the Outrigger Waikiki in a canoe and posed for pictures with visitors who sat with him as he roamed around the beach and hotel. 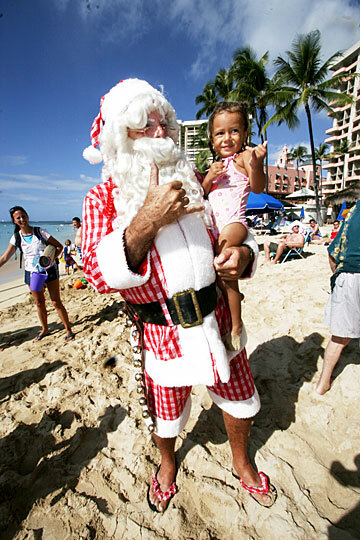 Two-year-old Lokana Becker joined Santa in flashing a shaka sign to her mom as she took a picture. 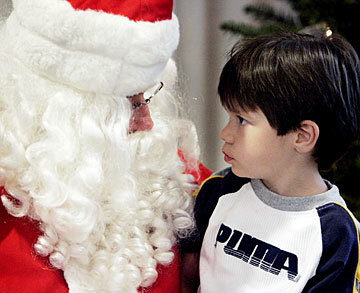 Reece Aiwohi, 4, was serious about his wish list when he met with Santa yesterday at Prevent Child Abuse Hawaii's 19th annual Breakfast with Santa held at the Japanese Cultural Center of Hawaii.